Workshops/Presentations – Redwing Keyssar, R.N. In this recent role she developed a state-of-the-art Palliative Care Volunteer training program and along with the interdisciplinary team at JFCS, they have trained over 150 people from age 18-88, to learn how to serve and support those with serious illness or those who are at the end of life. At its essence, the Palliative Care Volunteer training is a course in living and dying, helping us all be prepared for the one inevitable journey that we all must take. 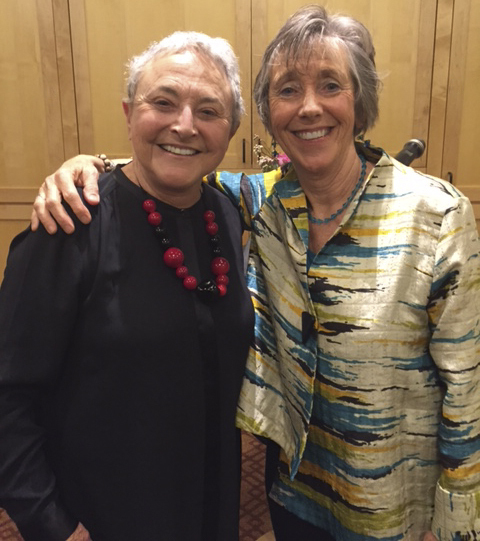 Sylvia Boorstein and Redwing Keyssar at their April 13, 2016 presentation, JFCS’ Seniors At Home’s NEW Palliative Care Lecture Series, "Let's Keep Talking About ..."
Redwing continues to offer day-long and weekend workshops, presentations and keynotes, as well as private consultations and advocacy regarding issues of palliative and end of life care. For consultations, keynotes, presentations or workshops, please contact Redwing.